Monitoring & Evaluation (M&E) is an essential part of the process of adaptive management, the process of learning from our actions in order to update and improve future ecosystem management. Across Europe we have a number of policies that are major influences on how we manage and monitor our ecosystems: therefore it is important to examine if and how these policies are shaping monitoring and evaluation. 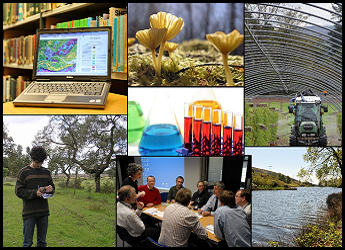 Social scientists at the James Hutton Institute are coordinating this interdisciplinary initiative. We are focusing on 3 policies relevant and comparable across Europe: the Natura 2000 Directives; the Water Framework Directive; and Agri-Environment Schemes under the Common Agricultural Policy. We aim to (i) synthesise the current state of policy-driven monitoring & evaluation across Europe, (ii) compare these practices to the current recommendations in the literature, and (iii) identify accessible recommendations for improving monitoring and evaluation in order to better support adaptive ecosystem management. We and our partners represent 10 countries across Europe. Our partners are: the Finnish Environment Institute (SYKE); the Flemish Institute for Nature and Forest (INBO); the Estonian University of Life Sciences (EMU); the Norwegian Institute for Nature Research (NINA); the Slovak Academy of Sciences (SAS); the Hungary Academy of Sciences Centre for Ecological Research (MTA); the University of Bucharest; the Ecological and Forestry Research Applications Centre at the University of Barcelona (CREAF); and the Swedish University of Agricultural Sciences (SLU). Our methods uses an analysis of in the public domain by our partners, deliberatively analysed in a workshop in June 2017 and further virtual meetings in August 2017. The analysis has been guided by criteria for monitoring and evaluation that were established in prior work by the MEEM leaders (Waylen & Blackstock, 2017). We produced a report summarising the preliminary findings: Blackstock K.L. et al. (2017) Monitoring and Evaluation for Ecosystem Management (MEEM), Technical Report, James Hutton Institute, 96 pages. An overview of the MEEM project and its findings is available in this pdf slideshow. The main challenges and implications for improving monitoring and evaluation are captured in this four-page briefing. The main academic insights are available in this paper in Science of the Total of the Environment.This is available open access to all via https://doi.org/10.1016/j.scitotenv.2018.12.462. We also hope to discuss the implications of this report with policy-makers as specific places will face different challenges, and we realise that document analysis rarely gives a full picture of what happens in practice. For more information about this research contact Kerry Waylen (kerry.waylen@hutton.ac.uk). This project is a 'High Impact Action' funded by ALTER-Net, Europe's ecosystem research network. More information about this and other High Impact Actions is available from http://www.alter-net.info/ahia The time of the Hutton staff is funded by the Scottish Government RESAS Strategic Research Programme 2016-21.